I’m excited to share a guest post by Rhelena from Crochet Pattern Bonanza with you today. You may remember Rhelena from this interview last year. Rhelena is a talented crochet designer and blogger at CrochetN’Crafts and Rhelena’s Crochet Blog. She’s also the blogger behind Crochet Pattern Bonanza, a free crochet pattern directory. It’s a great place to go to find your next project — it currently has over 7,000 patterns in its database! Crocheted baby blankets are perfect for keeping your little ones super cozy in the cold winter weather. They are not only great for the crib, but they also make for excellent covers in the stroller, or in the car. And to make them super cozy, you can always line them with a cotton or fleece material. Rippled Security Blanket by Underground Crafter: This baby blanket is not only cozy, but it’s also got a lovely rippled texture to please any baby boy or girl. Everyday Blanket by JustCrochet: I just love the gorgeous texture in this pretty striped blanket. It’s appliqued in flowers for a girl, but choose any appliques you like to suit a boy as well. I Love This Soft Ripple Baby Blanket by EyeLoveKnots: This chevron blanket works up in five hours or so depending on how fast you crochet. Thus, it’s the perfect blankie as a last-minute baby shower gift. Celtic Weave Blanket by Pattern Paradise: Here is one that you definitely do not want to miss. The texture is not only gorgeous, but it also makes for a cozy, soft and cushiony baby blanket. For Kyle Baby Blanket by Underground Crafter: Here is another gorgeously textured and striped blanket to keep your little ones cozy and happy. Plus, I’m seeing cute little hearts that go horizontally along the stripes. How cool is that? Optical Illusion Baby Blanket by Stitch11: Need something colorful? Then why not opt for this optical illusion blanket? It is sure to be a hit and look gorgeous in any baby room. Easy Star Stitch Baby Blanket by AG Handmades: The star stitch is always pretty, and this baby blanket is no exception. The finished size of this is approximately 30 by 30 inches. Patchwork Baby Blanket by CrochetKim: This colorful blanket is crocheted up in tiny squares. The squares are joined together as you go to form strips. Diagonal Rainbows Baby Blanket by Underground Crafter: Love rainbows and the diagonal blanket stitch? If so, then you’ll have a blast crocheting this one up. And it’s bound to add a touch of paradise to any room. Cluster V-Stitch Striped Blanket with Shell Border by Repeat Crafter Me: This beauty is crocheted in the cluster V-Stitch pattern. It’s got a lovely texture and a pretty striped chevron design. Cluster Color Blocked Preemie Blanket by Cream Of The Cop Crochet: It looks like it’s got a lovely lace, yet the pretty clusters are sure to bring lots of coziness for your preemie baby. And although shown in a lovely boy color, this would look just as lovely in a girls’ color as well. Blossom Baby Blanket by CrochetN’Crafts: A pretty stitch and pretty texture on both sides, makes this blanket ideal for both baby boys and girls. 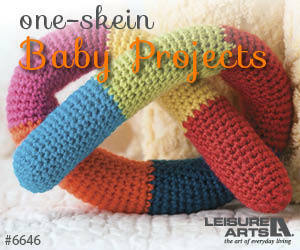 I hope that you enjoyed this roundup of free baby blanket crochet patterns. And if so, you might also enjoy a visit to Crochet Pattern Bonanza for more free patterns for crochet baby blankets. Thanks, Rhelena, for sharing these beautiful patterns with us!